We are not the authors of these game, but we tried and liked them. So we propose you to discover them. UBM is a game that will let you take the role of a boxing manager. You'll be able to look for new talents, hire already famous boxers, and of course train them as you like. Have you ever wanted to be President ? 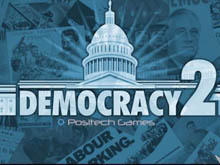 Democracy 2, the ultimate political strategy / simulation game, lets you define your policies and see how well you can rule the country ! It can be very challenging, and you'll learn many things playing that game ! 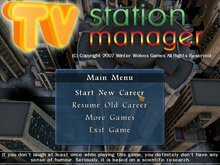 TV Station Manager is a simulation game that lets you take control of a small independent TV station, about to go bankrupt. The current TV boss hired you to help the company recover from this bad situation, so now it's up to you! You'll have full decisional powers! Featuring an easy interface, including tooltips and a tutorial to get fast into the game.